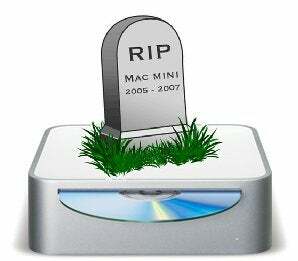 Kasper at Appleinsider is telling us that his sources have informed him that the Mac mini will Die. ...sources, for whom AppleInsider holds the utmost respect, are now pointing towards the mini's impending demise. Then he immediately hedges his bet as far as timing. We all die some day, but the tombstone says 2007, so that's when he's placing his bet. His reasons are good, but not by any means do they point 100% to the demise of the M&M. Due to its small footprint and low cost, it was immediately nominated by seasoned techies as the perfect media server for the living room. But with the advent of Apple TV, Apple seems to have shoved the diminutive device into the far corner of what had already been a niche audience. Kasper is 100%, but we'll label this as a rumor. A big, fat juicy rumor. So don't go trading any stock.